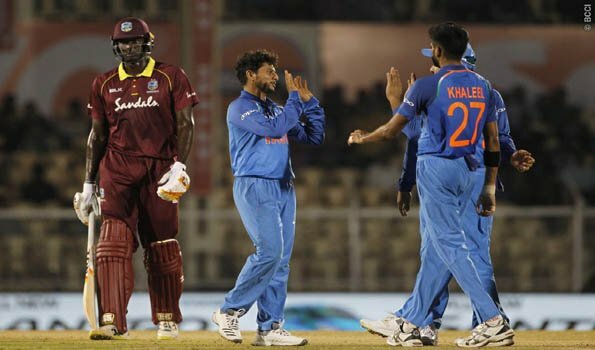 Lucknow: Once again showing its poor performance, guest team West Indies on Tuesday lost to host India by 71 runs in second T20 match here at Ekana cricket stadium.With this win, India clinched three match series with 2-0. The guest team got off to a bad start and lost their first wicket on a score of just seven runs, giving the hosts team to celebrate. Khaleel Ahmed gave India its first breakthrough as he sent Shai Hope to pavilion for six runs. Fans witnessed couple of shots from second opener Shimron Hetmyer and expected him to pull out caribbean from the situation along with increasing run rate, but unfortunately, he couldn't survive long on the crease and got dismissed for 15 runs off 14 balls. Ahmed took Hetmyer's wicket. Darren Bravo, Denesh Ramdin,Nicholas Pooran and Kieron Pollard, none of them even managed to cross 40 runs and were dismissed one after another. Bravo, somehow, managed to score 20 runs off 18 balls but he too followed his mates and went back to pavilion. So far, West Indies has already lost their opener as well middle order.Kuldeep Yadav, took the Bravo wicket as he backed away and went with hard hands on the cut, got a thick top-edge and handed over a catch at the slips. The guest team were on 68/5 after 11 overs, needed 128 more runs to win, when Kieron Pollard got dismissed by Jasprit Bumrah. Pollard was caught off-guard as he sent the ball high up in the air and Bumrah did his job by takin a comfortable catch. Earlier, Rohit Sharma brilliant century (111) unbeaten and Shikhar Dhawan (43) helped India score 195/2 in the allotted 20 overs of the second T201.West Indies won the toss and opted to field first putting India to bat. India with their opening pair of Shikhar Dhawan 43 (41) and skipper Rohit Sharma 72 (45) went on to add 123 runs for their first wicket partnership, but in the 14th over Shikhar lost his wicket after being caught off by Pooran in Allen's spell.Shikhar contributed 43 off 41 with 3 fours. After Shikhar's departure it was turn of Rishabh Pant who was caught by Hetmyer in Pierre bowl in 16th over.Pant scored 5 off 6. While KL Rahul remained not out at 26 off 14 with 2 fours and a six. Stand-in skipper Rohit Sharma who also remained unbeaten blasted off 111 runs off 61 balls with 8 fours and 7 sixes also surpassed Virat Kohli to become the highest run scorer for India in Twenty20 Internationals (T20Is).